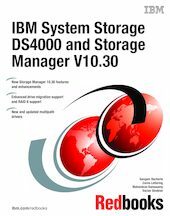 This IBM Redbooks publication consolidates, in one document, detailed descriptions of the hardware configurations and options offered as part of the DS4000 series of storage servers. This edition covers updates and additional functions available with the DS4000 Storage Manager Version 10.30 (firmware level 7.15). This book presents the concepts and functions used in planning and managing the DS4000 storage servers. Concepts such as multipathing and path failover are discussed. The book offers a step-by-step guide to using the Storage Manager to create arrays, logical drives, and other basic (as well as advanced) management tasks. This publication also contains practical information about diagnostics and troubleshooting, and includes practical examples of how to use scripts and the command-line interface. This book covers the Copy Services premium features and their implementation and usage. Another section discusses how to boot servers from SAN-attached DS4000 disks (SAN boot). This publication is intended for customers, IBM Business Partners, and IBM technical professionals who want to learn more about the capabilities and advanced functions of the DS4000 series of storage servers with Storage Manager Software 10.30. It also targets those who have a DS4000 storage system and need detailed advice about how to configure it.